I have not written a blog entry in far too long. My apologies to those faithful people who signed up to read what I would write. I had a knee replacement on November 27 and that took my mind off writing blogs for my web page, though I did write some on Facebook. I am continuing to recover following the replacement but rehab does not happen in a day or two. Today at Physical Therapy my knee measured 98 degrees of bend which was more than I was expecting. Yay! And I am up to walking a half mile twice a day if weather and my schedule cooperate. However, if the knee is still for more than 5 minutes it reverts to pretending it is stuck in concrete and requires up to 20 efforts to bend it until it again agrees. So I am still not driving as bending ones knee 20 times before hitting the brake could be a bad thing. While laid up with a recovering knee I have had quite a trip watching how my book is selling on Amazon. It has actually sold pretty darn well, a surprise to me and quite exciting. In 2018 it sold 2,999 copies and people still appear to be buying it in 2019. One day it was even the best seller in two categories in the Kindle store. Often it has been #2-3 and right now #4. Funny, the #1 ranking day was definitely not the day with the most books sold. Your ranking depends as much on the number of books sold by other people on a particular day as it does on how many of your books sell that same day. At any rate I am quite happy with how this adventure is going. Reading reviews is another adventure too. Several reviews wish I had included pictures. Yes, I have thousands. But pictures would have raised the price of the book quite significantly and probably few copies would have been sold because of the price. 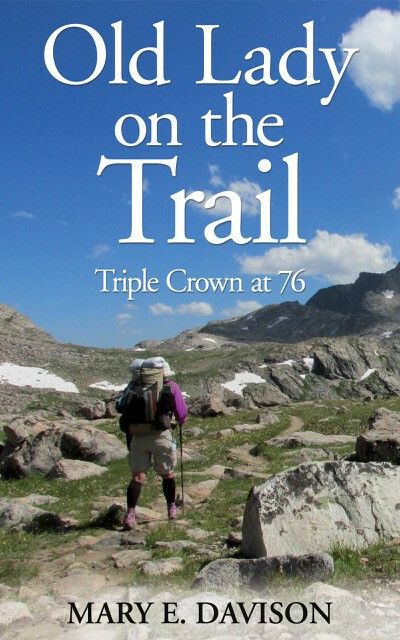 Some reviews say Old Lady on the Trail is the best trail book they ever read and is very well written. A couple others said the book was a waste of time and money and poorly written. Fortunately there are far more of the former comments than the latter. Interestingly, some complain about the time spent on flowers and some rave about the descriptions of flowers. Some find it repetitious and some appreciate every detail. Some like my emphasis on aging and others complain that I talk too much about being old. I have come to the conclusion that reviews tell me more about the people writing them than about the book. Yet a writer is very dependent upon there being reviews. Another author told me every positive review is worth $100 in sales. I am grateful for everyone who took the time to write a review, although I admit I enjoy reading the positive ones more than the negative ones. I also appreciate each person who has signed on to this site to receive blogs and updates from me. May 2019 bring healing, adventure, creativity, and enjoyment of the beauty of this world from me to you and back again. Life is good. I am amazed that the book is doing so well, I am even more amazed at all the help so many people are giving me. Two pastor friends fought over who was going to get the first book signing with the result that Pastor Jan Otto and Pastor Mary Corning Sanders are co-sponsoring a book signing at All Saints Lutheran Church, Auburn, Washington, on November 18, 2018 from 2:00-3:30. I know not everyone who would like me to sign their book or Kindle page lives in Southwestern Washington but if you are there or visiting, you may enjoy the event. There is more than one way to have an adventure. I am neither hiking nor writing. I am being Grandma. The adventure is my daughter’s and her family’s. They plan to travel the United States for a year or two when her husband retires from the Army. So they put their house up for sale, bought an RV and are practicing living in a 43 foot toyhauler RV for a little less than a year. It sounds like a big space until you consider that they have eight children, ages 13 and under. And I came to visit. My bed is a hassock in the daytime and a bed at the edge of the kitchen at night. Mom and Dad have a bed in a room of their own, Two girls share a loft. Six boys share queen bunks in the toyhauler part of the RV, big boys on the top bunk and little boys on the bottom. It is real togetherness. In the morning we have school. My daughter homeschools and I help with reading, comprehension questions, and nagging to get the work done. Walking to explore the area with a grandson, playing in playgrounds, bouncing on the bouncy pillow, (I just watch, my knee is in no shape to bounce.) a couple campfires, s’mores and a good bit of general chaos fill the days. And I have only been here a week. Being Grandma is another glorious adventure. Amazing. Someone told me after church on Sunday that Old Lady on the Trail was #1 First Release on Amazon. When I got home I looked it up. Indeed, it was so. Well mostly. Kindle is showing it is #1 First Release in its categories and at one point it was as high in categories as 4. I am sure that is thanks to friends and hiker groups I have found on Face Book. Many thanks to those who have bought the book in Kindle or in Paperback. I eagerly wait to see some reviews but it does take a bit of time to read. Some folks have posted on Face Book that they enjoy reading it and have told others. How wondrous to watch other people enjoy what I have written. This is all a whole new world for me. November 18 there will be a book signing at All Saints Lutheran Church, although I do not know the time for that yet either. I will post when time has been decided. As a first time author, and an old lady at that, this is an amazing experience. And yes, I hope to write another book or two. Old Lady on the Trail is live on Amazon today! Amazon surprised me a little. The Kindle version went up live yesterday for pre-order. The paperback was in review. They said it could take 3 days. Then, bingo, they just put it all up live last night. I suppose it is sort of like a preorder as it takes a little time to reach you. The plan for getting lots of people to buy it on the same day which helps an author’s standings is sort of gone. But I am VERY excited to say the book is live. Go to Amazon. Write in Old Lady on the Trail book and you will see the book in kindle and in paperback. Purchase whatever you want. I hope you enjoy the read! If you enjoy this book, please write a review and post on Amazon or Goodreads to help another reader decide on this book.